NEW YORK (TheStreet) — The Dow Jones Industrial Average shot into positive territory Wednesday as commentary from the Federal Reserve on plans to shore up the U.S. housing market overshadowed European debt crisis concerns. The Dow rose 21 points, or 0.2%, to close at 12,418, after falling 0.5% earlier in the day. 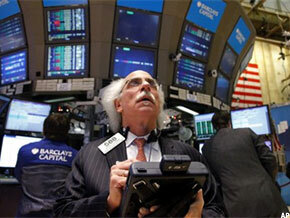 The S&P 500 climbed less than a point to 1,277, while the Nasdaq slid less than a point to 2,648. The turn higher came after the central bank sent a white paper to Congress calling for the federal government to take more action to stabilize the still-floundering U.S. housing market. The paper suggests “redeploying foreclosed homes as rental properties” as a possibility for combating an expected flood of foreclosures hitting the market and prompting another pricing swoon. Your one-stop shop for 2012 stock recommendations and market predictions. Concerns about Europe’s sovereign debt crisis resurfaced Wednesday with early declines underlined by fresh worries that the situation in Spain is worsening. The Iberian country is considering applying for loans from the eurozone bailout fund and the International Monetary Fund to help the restructuring of its banking industry, the Spanish newspaper Expansion reported, citing anonymous sources. Also, overnight deposits of commercial lenders hit a record high at the European Central Bank, suggesting that Europe’s banks remain incredibly cautious about lending to each other. Shares of UniCredit, Italy’s largest bank, sank 14.5% after the lender said it will sell $9.8 billion worth of new shares to boost capital. Investors are also sensitive to rising borrowing costs in the eurozone with a France holding a bond auction on Thursday, and Italy and Spain about to sell debt next week. Germany’s DAX lost 0.89% while London’s FTSE was down 0.55%. Overnight, Japan’s Nikkei Average settled 1.24% higher, and Hong Kong’s Hang Seng was down 0.8%. The U.S., however, received another piece of positive economic data. The Commerce Department reported that U.S. factory orders rose 1.8% in November after a 0.4% fall in October, slightly beating the 1.7% forecast of economists polled by Thomson Reuters. Meanwhile, General Motors(GM_), Ford Motor(F_) and Chrysler Group beat analysts’ estimates for December car sales, with sales getting a boost from increasing consumer confidence and ads around the holiday season. GM said that its December sales rose 5%, led by a 9% gain at Chevrolet. For the full year, GM sales rose 14%, to more than 2.5 million vehicles, and GM gained market share. Ford said that its car sales rose 10% last month and 11% for the year. Meanwhile, Chrysler’s sales jumped 37% in December. GM traded 0.5% higher while shares of Ford rose 1.5% on Wednesday. In other corporate news, Yahoo! (YHOO_) tapped PayPal President Scott Thompson, who runs eBay’s (EBAY_) online payments unit. Yahoo! had been without a permanent CEO since firing Carol Bartz in September. Shares fell 3.1% to $15.78. A big mover in afternoon trades was Eastman Kodak(EK_) following a report that the 132-year old company is preparing to file for bankruptcy in the “coming weeks if it fails to sell its patents. The report from The Wall Street Journal, which cited anonymous sources, comes after months of speculation that the company was preparing to take this step. Kodak shares tumbled 28% to 47 cents. Jefferies Group’s(JEF_) executives and other employees at the company’s prime-brokerage unit threatened to leave the firm in a dispute over issues including a recent restructuring and year-end compensation, The Wall Street Journal reported, citing people familiar with the matter. Jefferies executives and its global head of prime brokerage, Glen Dailey, reportedly held meetings Tuesday to discuss the issues but Dailey said that no one was leaving, adding that the “family affairs are now in order.” Jefferies in recent weeks has seen its stock under attack over its European exposure. Shares slipped 2.6% to $13.64. Acme Packet(APKT_), a networking-equipment maker, lowered its outlook for the fourth quarter. The company, whose products include both hardware and software, now sees non-GAAP earnings of 26 cents to 28 cents a share for the three months ended Dec. 31 on revenue ranging from $84 million to $86 million. The current average estimate of analysts polled by Thomson Reuters is for a profit of 37 cents a share in the quarter on revenue of $93.4 million. Shares plunged 19% to $25.70. With most of the day’s trading in negative territory stocks barely hung on to Tuesday’s strong New Year’s rally, which saw the S&P 500 index finish at its highest level since late October. The Dow, up 1.5%, closed at its highest since July 2011. Analysts think that the S&P 500 will gain 6.6% by the year’s end, compared with a flat finish for 2011, according to polls by Reuters. Investors are now looking carefully at how stocks perform the first days into the new year, as track records show that positive momentum in January often translates into a bullish year overall. February oil futures settled up 26 cents to $103.25 a barrel, while February gold futures gained $12.20 at $1611.90. The dollar index was up 0.5%. The benchmark 10-year Treasury was down 12/32, pushing the yield to 1.991%. — Written by Kaitlyn Kiernan in New York.